This post is continued from my previous related post; Top 10 Countries with Longevity. To consume more vegetable and fruit than meat each day. It's suggested to consume more home cooked food in order to maintain low calories and to cut down from taking too much fatty, salty and oily food. Daily exercising such as walking around neighbourhood for about 30 minutes per day. Avoid excessive liquor and smoking as well as to prevent from taking too much of junk food, fast food, sweet dessert and cake including soft drink. Coping well with stress also helps to reduce the risk of health problems. How to live over a hundred and still be in the pink of health? Okinawans are among the world’s longest-lived people. They have the highest number of centenarians and it’s almost inspiring how most of them are active, alert and not stuck in some wheelchair. Cancer, Alzheimer’s and heart disease is almost unheard of in the elderly. Instead, these sprightly seniors are plucking fruit, making pottery and farming their own vegetables. Part of their longevity is attributed to their diet and philosophy of “nuchi gusui” or “let food be your medicine”. They treat their food as a source of healing power. The food combines influences from China, Japan, Korea, and even South-east Asia. It’s a diet that’s largely plant-based, low in fat, salt and sugar. You’ll see that it is almost frugal. But despite being low-calorie, the food is quite filling and nutrient-dense. There is a focus on whole grains, vegetables and soy, which provide flavonols, isoflavones and bioflavonoids (powerful compounds that help prevent cancer). They emphasize the right amount of protein (just 10%), usually fish rich in omega-3 oils. Meat (notably pork) is consumed, but in limited quantities and most often during festivals. “Kuten gwa” – to eat little portions of many different foods – is the other guiding principle for eating. This helps them net a good variety of nutrients. The wide range of ingredients they like include “goya” or bittergourd, one of Okinawa’s signature vegetables. 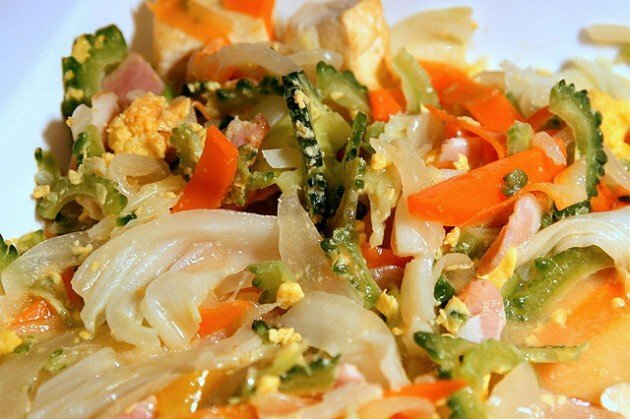 It is often stir-fried with egg and other vegetables. Dark leafy greens and yellow-orange vegetables not only add more carotenoids and antioxidants, but also help to make the dish more colourful and pleasing to the eye. Interestingly, papaya is eaten as a vegetable, not a fruit. It is often included as part of a “champuru” (mixed stir-fry). They also love ucchin or turmeric, which has medicinal and antioxidant properties. Pickled turmeric is served with rice, and turmeric is also used to marinate seafood. Shikuwasa (an Okinawan lime much like calamansi) provides a big boost of Vitamin C.
Sweet potatoes like beni-imo and satsuma-imo provide fibre, minerals, calcium, potassium and essential vitamins. Rice is eaten in smaller portions than they are in mainland Japan. 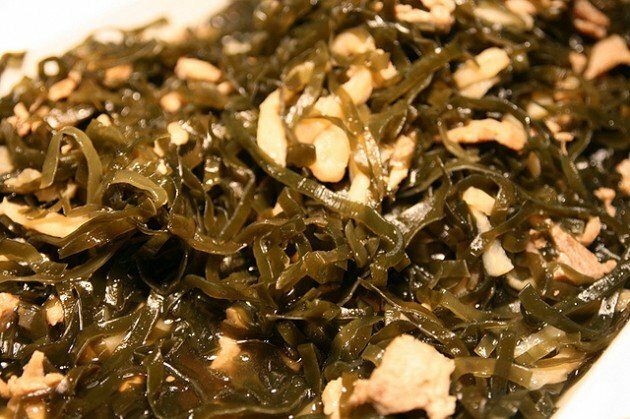 Given that Okinawa is surrounded by sea, they eat quite a lot of sea vegetables (rich in iron, folate, magnesium and lignan, a cancer-fighting phytoestrogen). Dairy is not a traditional food; they get their calcium from leafy greens, soy products and seaweed. 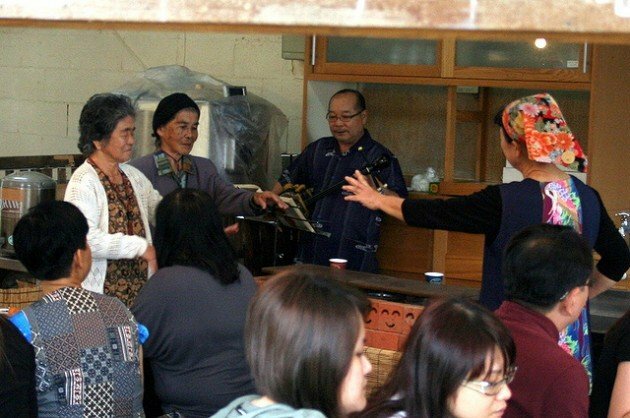 The Okinawans also practise “Hara hachi bu” or eating until you are 80% full. This makes sense because it takes about 20 minutes for the stomach to register that it is full. You would have eaten just enough if you had stopped before you felt full. Of course, plenty of other factors contribute to longevity such as exercise, optimism, good preventive healthcare, and strong community support. But the right kind of food is still what nourishes them and keeps Okinawans healthy and happy. Every meal is a cause for celebration – they eat mindfully, and joyfully. “Nan kuru nai sai” – don’t worry, be happy, they often say. That, along with their healthy diet practices, is surely worth emulating.